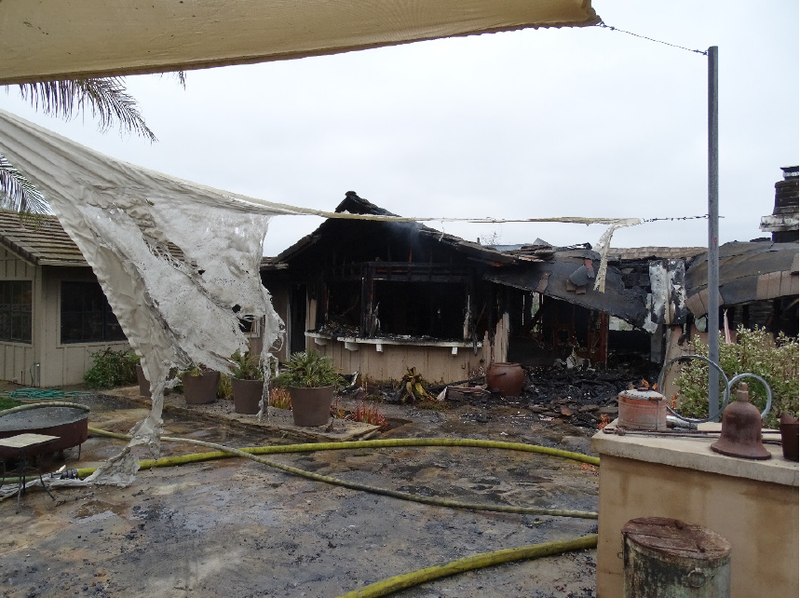 On June 5, 2018, at 4:51 a.m., Sheriff Deputies, along with the North County Fire Department, responded to a residential structure fire in the 31000 block of Via Puerta Del Sol in the community of Bonsall. The Sheriff’s Bomb/Arson Unit was requested and responded to the location to conduct an investigation into the cause of the fire. No injuries occurred as a result of this fire. The damage caused to the structure is estimated at $900,000. The cause of the fire is still under investigation. Investigators are asking any witnesses to this fire to please contact them. 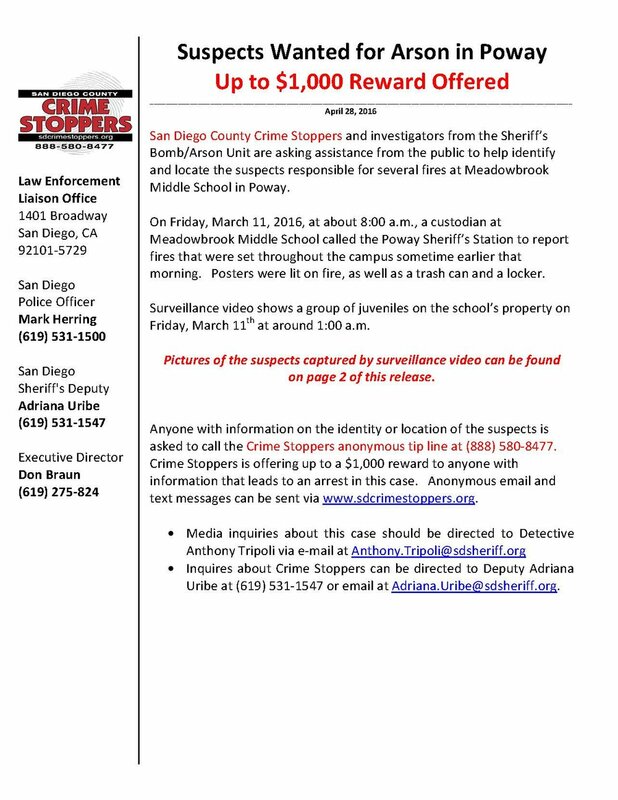 If you have any information on this fire please call the Sheriff’s Bomb/Arson Unit at (619) 956-4980 or the Crime Stoppers anonymous tip line at (888) 580-8477. Crime Stoppers is offering up to a $1,000 reward to anyone with information that leads to an arrest in this case. Information on how to send anonymous web and mobile app tips can be found on our website www.sdcrimestoppers.org. • Media inquiries about this case can be directed to Detective Arnold Van Lingen at (619) 660-3301 or email at Arnold.VanLingen@sdsheriff.org. 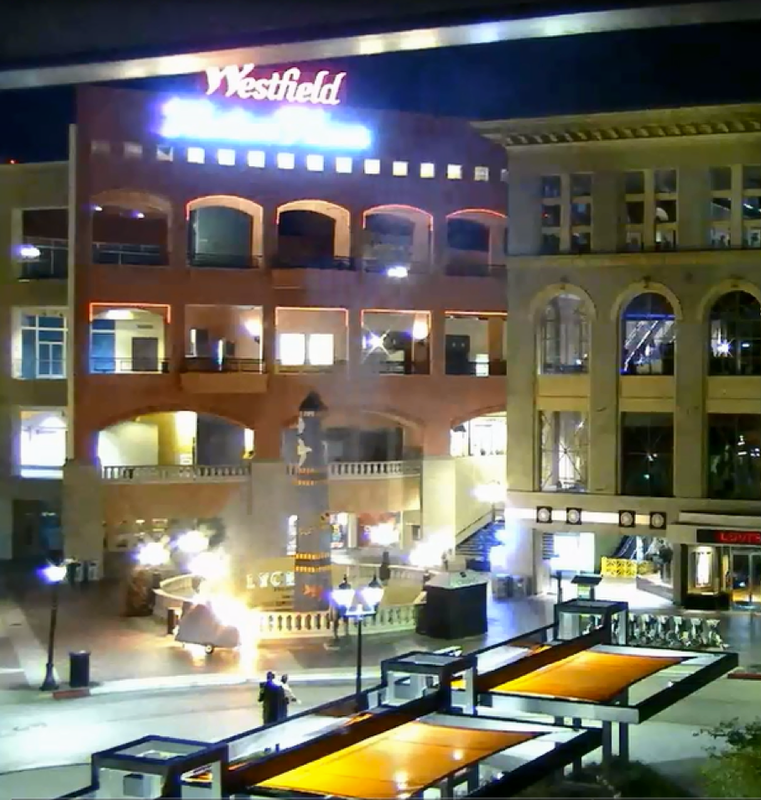 San Diego County Crime Stoppers and investigators from the San Diego Metro Arson Strike Team (MAST) are asking for the public’s help in identifying and locating an unknown suspect wanted for intentionally setting a hot dog cart on fire. On Sunday, September 24, 2017, at approximately 5:45 a.m., an unknown suspect lit the canvas cover to a Brooklyn Dogs hot dog cart on fire. The cart was parked near the main staircase to Horton Plaza at Broadway Circle and adjacent to Horton Plaza Park. The fire extended to the cart and caused an estimated $8,000.00 in damages. An unidentified person was seen running from the area at the time of the fire. Anyone with information about this arson case is asked to call the San Diego Metro Arson Strike Team at (619) 236-6815 or the Crime Stoppers anonymous tip line at (888) 580-8477. Crime Stoppers is offering up to a $1,000 reward to anyone with information that leads to an arrest in this case. Visit the Crime Stoppers website at www.sdcrimestoppers.org for more information on how to send anonymous web and mobile app tips. Media inquiries about this case should be directed to Sergeant Rick Pechin at (619) 236-7765 or email at rpechin@pd.sandiego.gov. On August 9, 2017, at approximately 9:53 p.m., an unknown suspect(s) lit a storage container on fire on the campus of Ocean Air Elementary School located at 11444 Canter Heights Drive, in San Diego. The storage container was positioned next to the exterior wall of one of the classrooms. As the fire increased in size and intensity, it traveled from the storage container into the wall of a classroom and caused an estimated $25,000 in damage. On August 13, 2017, at approximately 10:23 p.m., an unknown suspect(s) lit a storage container on fire on the campus of Sage Canyon Elementary School located at 5290 Harvest Run Drive, in San Diego. The storage container was positioned next to an exterior wall of one of the school buildings. The fire sprinklers were activated and controlled the fire until firefighters arrived to extinguish the blaze. A witness walking his dog in the park next to the school saw three unknown race males running towards a dark colored sedan and drove away southbound on Harvest Run Drive at a high rate of speed. Due to the nature of the fires, the close proximity of the two schools, and the times of occurrence, investigators believe the two incidents are related. Anyone with information about these arson cases is asked to call the San Diego Metro Arson Strike Team at (619) 236-6815 or the Crime Stoppers anonymous tip line at (888) 580-8477. Crime Stoppers is offering up to a $1,000 reward to anyone with information that leads to an arrest in this case. Visit the Crime Stoppers website at www.sdcrimestoppers.org for more information on how to send anonymous web and mobile app tips. San Diego County Crime Stoppers along with investigators from the San Diego County Sheriff’s Department’s Bomb/Arson Unit are asking for the public’s help in identifying and locating an unknown suspect(s) wanted for intentionally setting a vehicle on fire in Vista. On August 4, 2017, at approximately 1:16 a.m., the Vista Fire Department and deputies from the Vista Sheriff's Station responded to a vehicle fire in the 1900 block of Cherrywood Street. Firefighters put out the fire. A Toyota Sequoia, two Jet Ski’s, a trailer and surrounding vegetation were all destroyed by the fire. A person driving a dark colored sedan was seen leaving the area just prior to the arson. Investigators are asking for any witnesses to this incident to contact them. 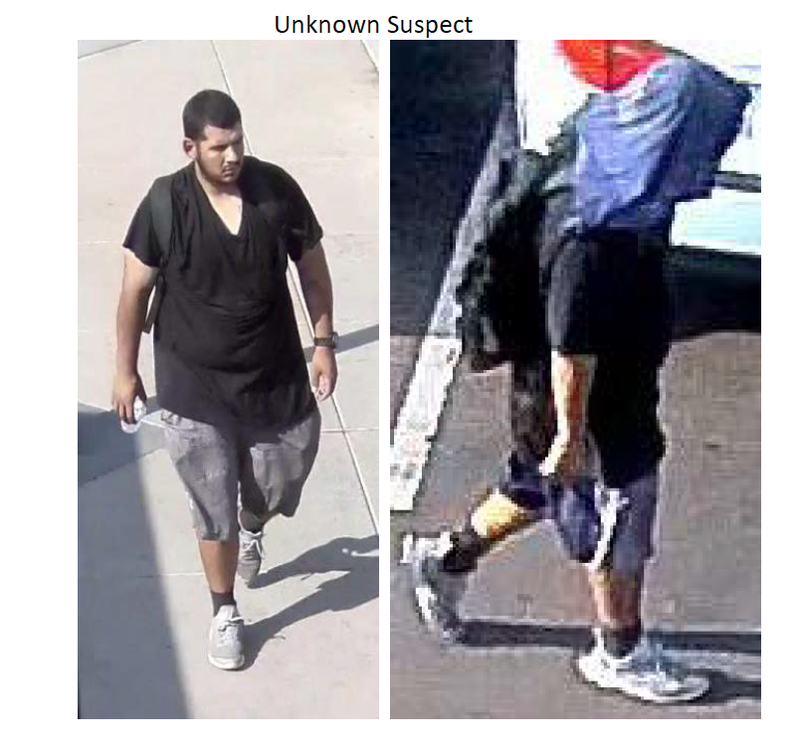 Anyone with information on the identity or location of the suspect(s) is asked to call the Sheriff’s Bomb/Arson Unit at (619) 550-8158 or the Crime Stoppers anonymous tip line at (888) 580-8477. Crime Stoppers is offering up to a $1,000 reward to anyone with information that leads to an arrest in this case. Information on how to send anonymous emails and mobile app tips can be found on our website at www.sdcrimestoppers.org. Media inquiries about this case can be directed to Detective Arnold Van Lingen at (619) 660-3301 or email at arnold.vanlingen@sdsheriff.org. San Diego County Crime Stoppers and investigators from the Coronado Police Department are asking for assistance from the public to help identify and locate an unknown male suspect wanted for arson, vandalism and petty theft. Detectives said that on December 10, 2013, at approximately 4:30 a..m., an unknown male suspect entered The Point Condominium complex, located at 1101 First Street in Coronado. The suspect threw a concrete ashtray into a decorative water fountain causing damage to the fountain. He then stole a Christmas wreath from the front door of one of the condos; a mailed package that was left near the community mailboxes; and a small green propane canister and a can of lighter fluid from a resident’s porch. The suspect lit all of the stolen items on fire in the center courtyard of the complex. The fire self extinguished and caused no damage to nearby structures. Possible suspect description: Possibly a White, or light skinned Hispanic male with brown hair, wearing a dark blue hooded jacket, light blue or gray jeans. A light blue beanie cap, gray tennis shoes with gray laces. He appeared to be unshaven with a short brown patchy beard. Anyone with information on this case should call the Crime Stoppers anonymous tip line at (888) 580-8477. Crime Stoppers is offering up to a $1,000 reward to anyone with information that leads to an arrest in this case. 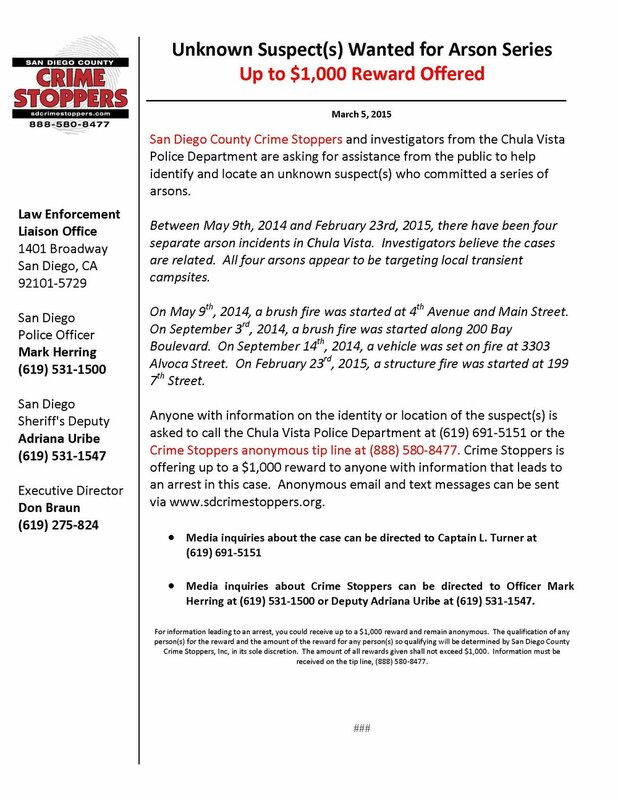 Anonymous email and text messages can be sent in via www.sdcrimestoppers.com. Media inquiries about the case can be directed to Lea Corbin at 619-522-7370.